This is one of the most famous Urdu ghazals, which is often attributed** to Bahadur Shah Zafar, perhaps, because of its melancholic tone [compare with Zafar's another ghazal HERE]. Most litterateurs agree that it's Muztar's poetry. Last couplet also has his name 'Muztar'. This ghazal is not in Zafar's diwan. Muztar Khairabadi [1865-1927] was Janisar Akhtar's father & Javed Akhtar's grandfather. 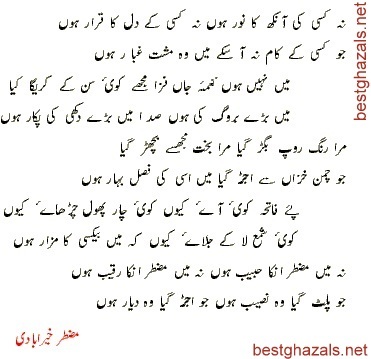 **['Qawwals' often take similar couplets from different ghazals and introduce them in another poets' ghazal. Also, folklore results in similar confusions. This ghazal had once stirred a major debate and literary heavyweights agreed that 'na kisi kee aankh ka nur huu...' was Muztar's ghazal. Occasionally, even today there are some people who insist that it is Zafar's ghazal. In a way, controversy continues. In Urdu poetry, there is also a tradition to write 'ghazals' in the zameen [meter-rhythm style] of famous poets. Hence, many other poets write similar ghazals and singers use better couplets from these ghazals while singing. In case of Ahmad Faraz' famous ghazal, 'Suna hai log usko aankh bhar ke dekhte hain....', there are several couplets which he didn't write but are sung. Though most of the senior litterateurs agree that it is Muztar's ghazal, there is a need to settle the debate once for all. This is what is expected from 'muhaqqiqs' in literature. They must find the truth through diligent tehqeeq [research]. Even other legends have not been spared. This ghazal is attributed to Mir Taqi Mir. Though the truth is that four couplets in this ghazal are taken from poet Ghafil's ghazal and four from another old poet Hawas' composition. These examples are given to inform the reader of this blog about literary issues. Muztar Khairabadi was a master poet of classical style. He was posted as judge in Tonk in Rajasthan [then Rajputana] in British India. He is known for being such a qaadir-ul-kalaam poet that he even wrote a long judgment in poetry. Those who claim it to be Zafar's ghazal insisted that Muztar couldn't have suffered such pain, which Zafar had to undergo. True, but this can not be sole premise. Zafar was the last Mughal king. It is said that Zauq, the court poet, often helped him with his ghazals.